The British Aggregates Association regrets to inform the industry of the sad loss of its Director and founder, Robert Durward, who passed away on 4 January 2018. Bob had been suffering from cancer since the summer and although he had been a fighter all of his life, this was one battle that he could not win. He was a remarkable man, not only was he the founder of a leading trade association for aggregate producers but he also he also set up and operated one of the most successful SME quarrying companies in the UK. He was absolutely passionate about looking after the rights and interests of the independent aggregate producers and was the leading campaigner against HMRC and the European Commission in trying to get the aggregate levy stopped. That case is still in the European Court after sixteen years of legal arguments and although it is sad that Bob will not see the conclusion, it is a measure of the man that he stuck rigidly to his belief throughout these years that the aggregate levy was an unfair tax, which should be removed. 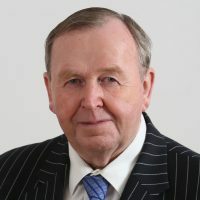 Although he often argued with politicians both in Westminster and Holyrood, nevertheless Bob earned their respect and was on first name terms with many senior ministers of government. He was keenly interested in politics and once set up a political party to take on what he regarded was the current political system. Only last year he wrote an excellent book on aspects of politics and government in the UK. As well as being very successful in business, he used his talent to help others and to that end he was involved in many local charities in Scotland including cooperative housing projects and the setting up of independent schools funded by local authorities. As an employer Bob was very far sighted both in the welfare conditions for his quarry employees as well as in health and safety provisions. Some years ago when the question of demonstrating competence was on everyone’s lips, Bob considered that that it should be the whole site that should be judged competent, not just the manager and supervisors. From that idea came the BAA Assessment of Operating Standards which soon became a recognised route by the HSE to improve safety standards in SME quarries. The funeral will take place on 23 January and will be a private affair. Robert Durward was special and will be sadly missed by all of the aggregates industry. Copyright British Aggregates Association, 2018. Design and hosting by Country Computers.